Vivian Ngo is currently the Northwest Vietnamese Student Association Regional President. When she is not teaching or being a president she enjoys exploring food and new scenery. Her favorite companion is her dog Cutie and her favorite place to get lost is in books. Previous to her current role as Northwest President, Vivian was an English instructor teaching abroad in Hampyeong, South Korea. 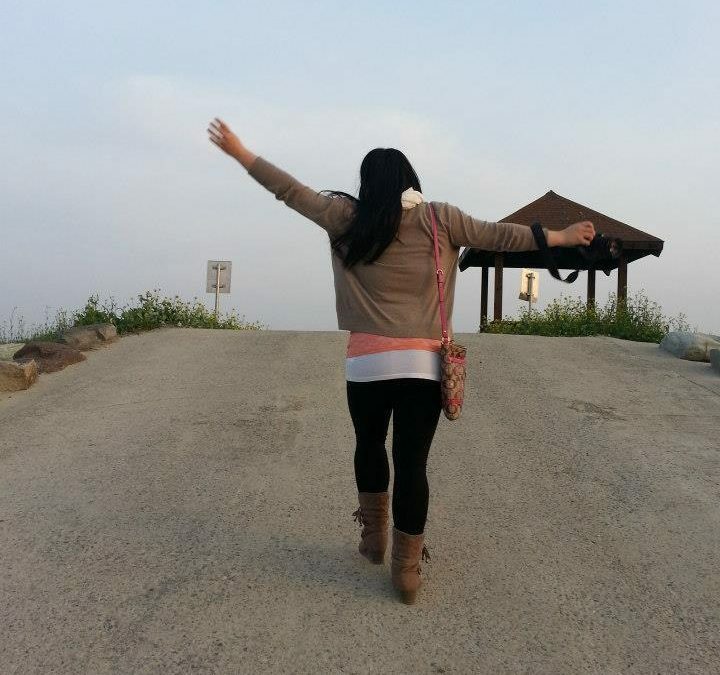 Continue reading below about Vivian’s journey about self-discovery and her travels to South Korea. Most people have a time in their life where they feel like they are lost or confused about what to do; life is too good at throwing curveballs. From childhood, we are clear about what our mission in life is: graduate high school, go to college, get a good job, start a family, and be a good person. The dreams and wishes that our family instills in us start from the moment that we are born, but the journey to get to these goals are varying. I remember growing up that I had my mind set on being a pediatrician. Surely, a medical degree would make my parents proud of me. For most of my life, I had lived to repay my parents for their sacrifices and hardships. I didn’t always succeed in making my parents proud or happy. For starters, I hated the piano. My parents spent thousands of dollars over the years for me to learn and master it. I will tell you right now, I am nowhere close to mastering it. The irony is, I love listening to the piano and instrumental music, but have no desire to play it. Although, my piano does make a good table in my basement. 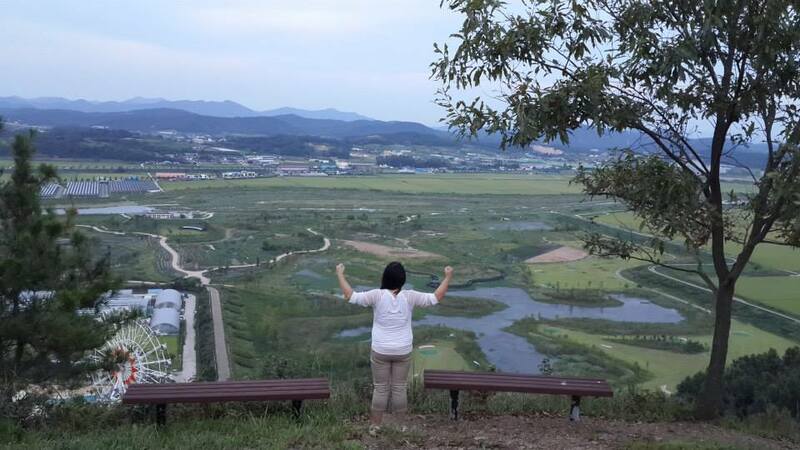 Vivian standing and overlooking “Nabi San” (나비 산) or Butterfly Mountain in Hampyeong, South Korea. Hampyeong is popularly known to be called “Land of the Butterflies” in South Korea. Another thing that I know that a lot of people struggle with is physical appearance. For the majority of my life…actually, for my entire life, I have heard complaints about my physical appearance. Plain and simple, I am not thin enough. People make it appoint to tell my parents that my weight is an issue. My parents never pressured me to become a pediatrician, but we all know that doctors are held to very high esteems. All I ever wanted to be able to help people and that career path would show that. As well as, maybe I will make money so that my parents can go to Vietnam whenever they want. These thoughts were so juvenile and naive. It was a young girl who did not make choices for herself, nor did she have a clue who she was as a person. I attended Pacific Lutheran University (PLU) for my undergraduate career. It was there that I was slapped with reality. I wouldn’t be able to handle being a pediatrician mentally. What was I kidding? My people-pleaser self couldn’t fathom the idea of not being able to help a patient. I realized that if I was faced with that situation, I would just fall apart completely and I didn’t want to have a career where I would be mentally broken the entire time. As my years at PLU progressed, I tried to figure out what to do next. I eventually stumbled upon geology and fell in love. Yes, I love rocks. But I also missed writing. The challenges of trying to formulate thoughts into cohesive sentences was exhilarating to me. I consistently took English courses and loved them and decided to also major in Creative Writing. Now, I could study rocks and write stories about them. 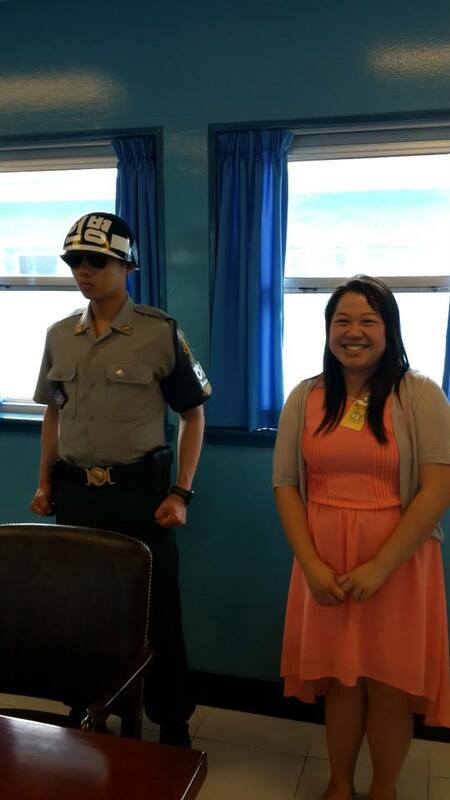 Vivian’s visit to the “DMZ” where her feet were on the North Korean side as she was accompanied by a South Korean soldier who kept guard. This photo was taken in 2013. Jump forward to my senior year of undergrad. I had no idea what my next steps in life were. I was starting to dabble with the idea of being a teacher, but I still was very interested in the field study for geology. I wanted to get my masters in something. I just needed to figure out what that something was. Like all great stories, mine contains a little bit of heartbreak. I had a serious boyfriend at the time and during Christmas, we broke up. I was devastated and quite frankly my world was turned upside down. Our plans for the future — my plans for the future were now even more up in the air. I decided to explore the possibilities of not going straight to graduate school and to potentially do a mission trip or to find jobs in the different fields that I was interested in. My friend told me about this opportunity to teach English in South Korea for a year. I have always asked my parents for permission to do things, as well as for their insight — but this time I just did it. I applied, interviewed, got the position and then I told my parents about it. They were shocked and believed that teaching would never allow me to access my fullest potential as a person. I remember being torn because if my parents were unhappy with my decision then I was not being a good daughter. Another friend sat me down and asked me what I truly wanted if my guilt did not play a factor in life. That was when I realized that I wanted to take the teaching position to see if teaching was really for me. I will never forget her telling me that it was time to start making decisions for me and nobody else. It is funny that it seems like such a simple concept, but I had thought it was one of the hardest things ever until the next incident. I would like to say that my story ended there, but nope. Sometimes life likes to completely shatter you. I don’t remember what I was doing before, but I remember the after very well. I was in my kitchen and then all of sudden my cousin from Vietnam was calling me. At that point, I don’t think I could even feel anything. I looked at my dad and brother Lyon. I blurted out that grandma was gone. They decided that it was best that I told my mom who was currently in the shower. The moment she stepped out of the shower and looked at me — I just bursted into tears. In hindsight, that was a terrible way to do it. My mom panicked and immediately asked me what was wrong. When I finally got the words out, she became hysterical. She begins questioning me about how and why no one told her that something was wrong, but I had no answers or knowledge of how to take away the pain. Lyon and my dad immediately helped my mom get her things in order to get her the first flight out to Vietnam, while I was tasked to once again deliver the news. This time I had to tell my brother Nick who was away at UNAVSA – 8 in Minnesota. I called and called, but I couldn’t get through. That was when I called my friend who was also there in a panic and had her hunt him down for me. By the time he called me back, he had sensed that something was wrong. For the second time that night, I had to break the heart of someone who I love. I told him and he was confused and like my mom didn’t understand. All I remember was him apologizing for not being able to be there and promising that he would be back soon. It has been almost six years, but the look on my mom’s face and the sound of Nick’s voice still haunts me around the end of July. As I write this, I am not sure why all these details are so important to share. I guess it all factored into solidifying me going to Korea, which I questioned more than ever after my grandma’s death. She lived in Vietnam my entire life, but I never questioned or felt less loved as a result of the distance. My second motivating factor in deciding to go to Korea was that I would have money and time to visit her. That plan was blown into a million pieces. I faltered with the idea of whether or not what I was doing was right. I was abandoning my family when we were all hurting. However, I realized it was going to be beginning of me living my life for myself. Brokenness can give you the motivation to do things that you never thought you would do. I was at my darkest when I left for Korea and when I left — I was only starting to mend myself.